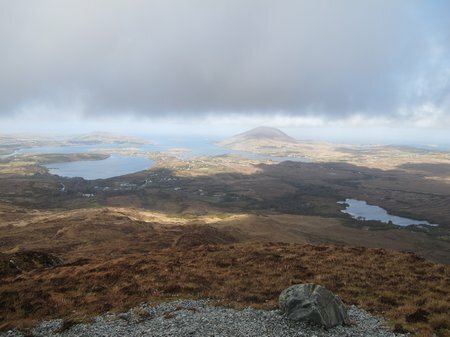 This is the trail map for the Diamond Hill hike in Connemara, Ireland, one of the most unusual hikes we’ve ever done. 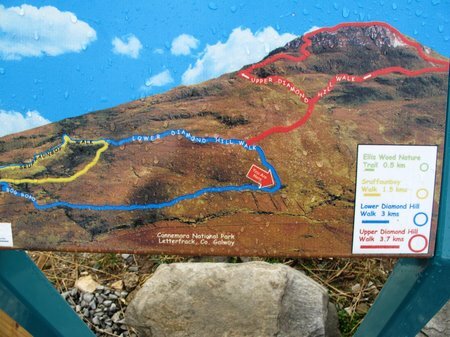 The trailhead is at the entrance to the Connemara National Park visitor center in Letterfrack, Galway. The hike, with an elevation gain of 1,350 feet (400 meters), is an easy walk on the lower loop (blue section above), a little more challenging at the start of the red section of the trail heading up the mountain and downright difficult with a steep incline on stone steps at the top. Even though it was a little cloudy as we started out, we had a clear view west across the valley towards the Atlantic for most of our hike. The lower sections of the hike alternate between a gravel trail and a wooden path over the blanket bog. This trail opens up safe access to the bogland which is a great bonus for the park. The amount of visible standing water is remarkable – if you’re ever looking for a visual definition of “sodden”, then this, in my opinion, would be it. Once above the lower trail, though, the terrain changes dramatically from wet bog to exposed rock interspersed with pockets of bog, grasses and heathers. While picking my way up to the top – and marvelling at how BigB could chatter non-stop as I huffed and puffed my way along beside him – I was intrigued at the construction of the trail. 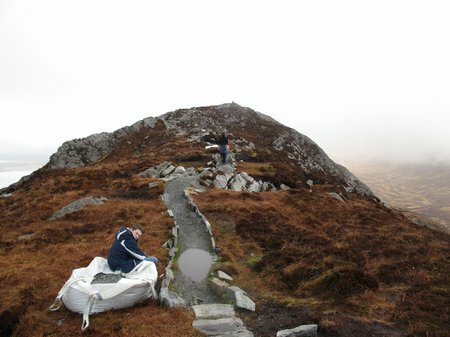 Large amounts of gravel and stone had been brought up the mountain and carefully laid to create the path. I later learned from my uncle, who lives in the area, that the construction materials had been deposited at the top by helicopter and that the trail construction had taken about six months. The view from the top is spectacular. You can see Kylemore Abbey (or, “Irish Hogwarts” as my boys nicknamed it) below and, if it’s clear, stunning views eastwards across the Twelve Bens and westwards out onto the Atlantic. If anything, the trail gradient seems steeper on the way down from the top and I would caution against trying this hike with very young children since a slight mis-step could lead to a nasty accident. Also, don’t try this hike without decent rain gear and good hiking shoes. Our luck with the weather ran out as we were coming down the upper section of the trail. It was only a 15-minute shower and we, in Seattle-tested outerwear, were warm and dry inside our rain gear but the jackets themselves were absolutely soaked. That said, by the time we approached the visitor center at the end of the hike, the sun was shining again. The path really flattens out here with fields on either side and sheep, lots of sheep. The visitor center at the park is worth checking out before you leave. Even though CAM groaned about having to “visit a museum about a bog! !”, the displays provide plenty of interesting information about this unusual ecosystem and it’s place in Irish history and language (my favorite: the display listing the myriad words for bog in Irish Gaelic). The park lands, currently owned by the State, were once part of Kylemore Abbey Estate and the Letterfrack Industrial School. The park buildings were all part of the Industrial School. This school, which operated from 1885 to 1974 is an ugly part of the history of Ireland (you can read details about this in reports produced by the Irish Child Abuse Commission). Some may wish that these buildings had been demolished as a way to remove this ugly history. Personally, I’m glad that the history has been preserved and these buildings, which saw so much pain and suffering, are now being used for something good. 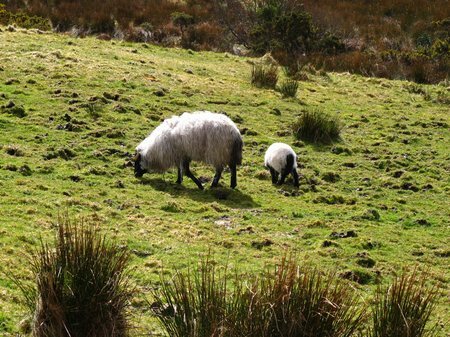 This entry was posted in International Escapades, Ireland and tagged Connemara, Connemara National Park, Ireland, Letterfrack Industrial School on April 11, 2010 by wandermom. Hilarious comment that CAM made about visiting a museum about a bog. It sounds like something I should check out- I’m not even sure I know what a ‘bog’ looks like, and nothing about the ecosystem for that matter. What an adventure up there! I love the second picture, it really shows the dramatic side of the Irish countryside. Ireland is definitely high on my list of places to visit.